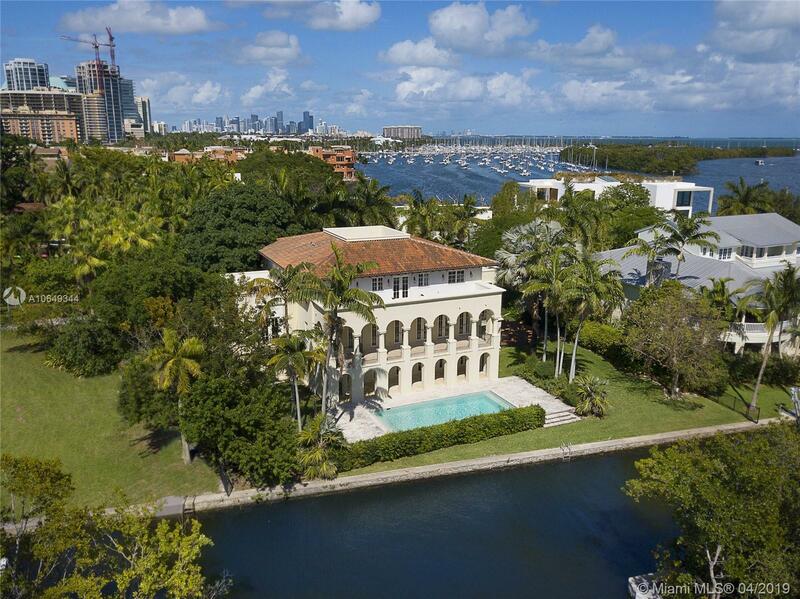 Ideally situated in the heart of the Grove behind gates of exclusive Camp Biscayne, this 2003 built home boasts 122â of water frontage & breathtaking views of the Bay, canal & natural landscape. The elegant style offers sophistication w/ details like mahogany trimmed impact glass drs & wndws, Brazilian wd & Jerusalem marble flrs, arches & vaulted ceilings. Formal spaces incl gracious dining rm & huge liv rm that flows out to a balcony spanning the back of the home. Cookâs kitchen offers gas, high end appliances & breakfast rm overlooking the canal. Outside are many covered balconies & open porches, including a roof top terrace & heated, saline pool w/ keystone flrs & views of the boat basin at La Brisa. 1st floor acâd bonus space w/ full bath, 2 car gar, organic mosquito repellant system. The content relating to real estate for sale on this web site comes in part from the IDX program of the JTHS Council of the MIAMI Association of REALTORS® and their Multiple Listing Service. The copyright for these listings is under the © 2019 MIAMI Association of REALTORS® MLS. This information is not verified for authenticity or accuracy and is not guaranteed. The information provided is for consumers personal, non-commercial use and may not be used for any purpose other than to identify prospective properties for purchasing. This information was last updated as of date specified below. Some properties which appear for sale on this web site may subsequently have sold or may no longer be available. Data last updated 2019-04-21 15:09:32.